Founded in 1809, Warren County is one of the oldest counties in the state. 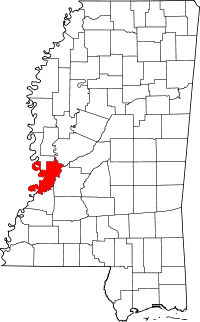 Both the Chancery and Circuit Clerks are in the county seat of Vicksburg, which is also the only town in the entire county. Both offices are quartered in the county courthouse on 1009 Cherry Street. The Chancery Clerk is in charge of land records, while the Circuit Clerk handles marriages. Also in Vicksburg is the Old Court House Museum which operates the McCardle Library, a research library that has over 1,400 documents and historical volumes all available for research. The library is open by appointment, and staff is on hand to assist with research. Also for research, the State Department of Archives and History operates a 140,000 square foot library in Jackson, MS, that is open to those who have a library card. The library has thousands of records on file, as well as many more in a free online database.